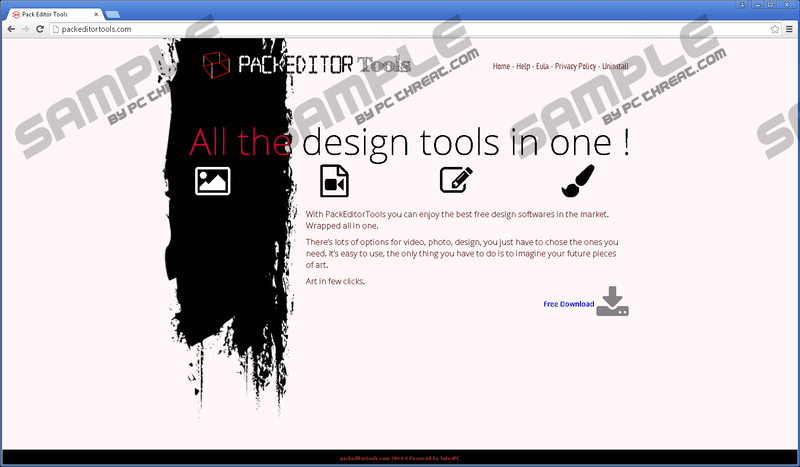 If you are looking for a certain tool to help you with various tasks involving design, you must know that a program called PackEditorTools should not be used for that. During the research, it has been found out that this suspicious tool is yet another adware program that should be removed from your computer once it is found running on it. It is important to note that the vendors of this ad-supported program use devious marketing strategies to lure unsuspecting Internet users into downloading and installing a program that will only ruin their online experience. Make sure not to trust any positive statements about this application since, in reality, it is a piece of worthless software. Read the rest of this article and learn about its functionality and why the removal of it should be your utmost priority. The removal guide that we provide below is easy to use; thus, you should not encounter any major problems during the procedure. The functionality of PackEditorTools is quite familiar to our malware researchers since quite a few adware programs of today rely on the same kind of methods to provide the user with the unwanted third-party web content. During the research it has been discovered that this particular adware program relies on a system service to present you that annoying web content, which in the majority of cases manifests itself as various third-party banner ads, coupons, and annoying pop-ups. The intrusive system service that runs in the background connects to various adware servers. Such servers are the primary source of all the ads and pop-ups. It is not surprising that such activity is extremely annoying. At times your web browser could be filled up so much that you could be forced to stop whatever you have been donning in order to close everything down since that is the only way to continue the browsing session. Complete removal of PackEditorTools is the only way that you can regain the standard functio0nalityu of your web browser. Unfortunately, there is something much more alarming about PackEditorTools that the annoyance that it causes. During the research, our team has discovered that in some cases this ad-supported program could provide you with ads that might be implemented with various redirect links. This is an extremely dangerous situation that you could find yourself in. This is so because by clicking on such an ad you could end up on a suspicious third-party website. For example, you could end up on a site that might be running an arbitrary code execution exploit, meaning that just entering such a website is well more than enough to get your operating system infected with some potentially malicious program. Avoid such a dangerous situation by conducting the removal of PackEditorTools right now. It should be more than obvious why the removal of PackEditorTools should be your utmost priority. Make sure to carefully follow each step of the removal to delete every single file and registry entries associated with this ad-supported program. We highly advise you to run an in-depth analysis of your PC to be sure that nothing related to this adware is active on your PC. Select PackEditorTools and then click the Uninstall button. Quick & tested solution for PackEditorTools removal.